As you may know, I've been mostly writing about my recent trip to Japan and time on the tv show Who Wants to Come to Japan. It's been a little while since I have posted something about food, which is silly since this is supposed to be a blog about food. However, while I've been writing about my trip, I keep having to describe all the delicious food I ate. This is a sort of torture because I can't eat the food. I want to eat the food. So, I've started recreating some of the dishes, to the best of my abilities. I started with the delicious sandwich I ate at the Haneda Airport, the morning after my arrival in Japan. I wrote about it here. For the pesto, I turned to my friend Savannah, who makes pesto all the time. I used fresh basil (organic), pine nuts, garlic, olive oil, and sea salt. If you're wondering why I didn't use parmesan, there were two reasons. First, Savannah is vegan, so she never puts cheese in her pesto. Second, and more importantly, my sister Sihaya is allergic to aged cheeses, especially parmesan, and I wanted her to try the sandwich. It's always best to make your pesto from scratch, but if you're in a hurry, you can use a store-bought pesto. 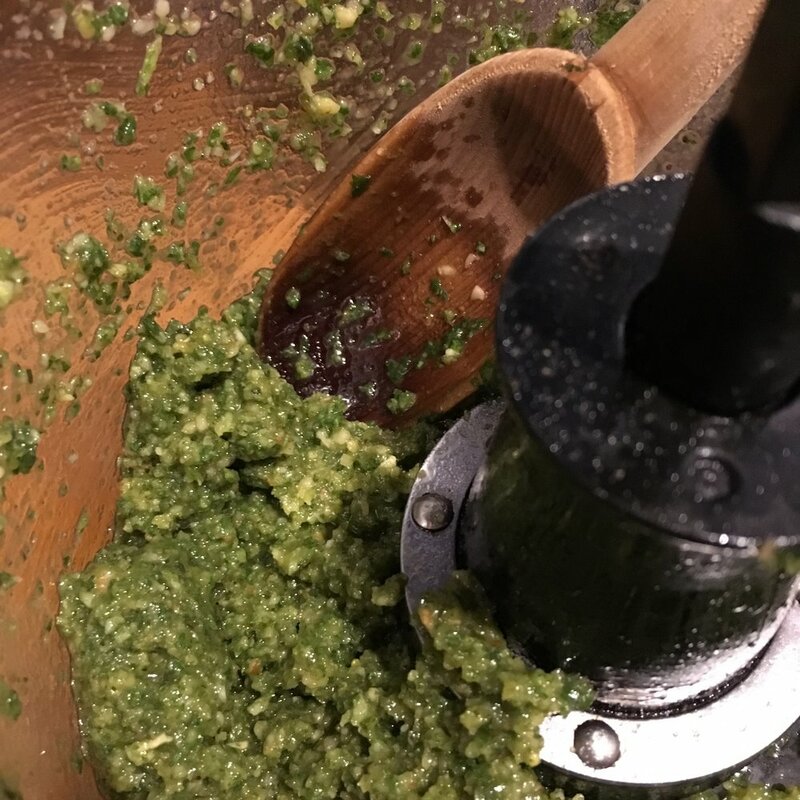 However, something about the way most brands make their pesto always makes them taste sour to me, so I like to make mine from scratch. Now, I said that the sandwich was made with pesto, but since I wrote that post I have thought a lot about this sandwich, and I do mean a lot. I have since come to the conclusion that it was actually a pesto aioli. If you don't know what aioli is, just think fancy flavored mayonnaise. 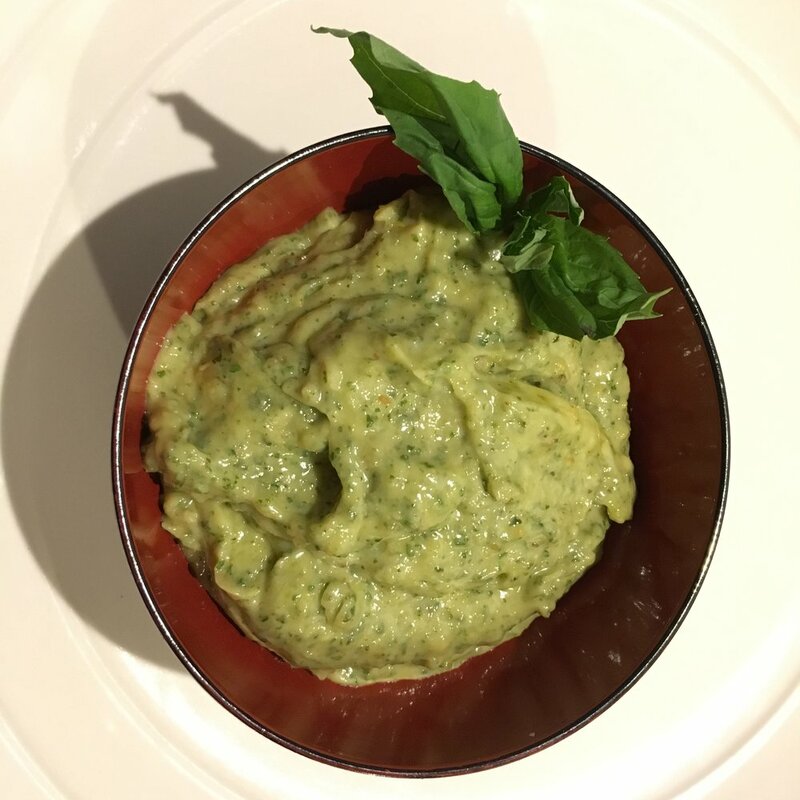 I could have achieved the desired effect by simply adding mayonnaise to my pesto, but if I was making the pest from scratch, I wanted to make the mayo from scratch too. This is actually pretty easy, and I do it a lot in the summer, thanks to my love for Japanese potato salad. The basic ingredients for mayonnaise are fresh eggs yolks, oil, an acid (vinegar or lemon work), salt, and a little mustard for flavor. I used rice vinegar, as this is a Japanese dish. Canola oil is always my first choice for mayo because it doesn't have a strong flavor, like olive oil. I use a garlic mustard for a little flavor boost and fresh eggs from one of the neighboring farms. The fresher your eggs are, the better the mayonnaise will come out. The hardest part about making mayo is simultaneous whisking and pouring a thin drizzle of oil into the bowl. I usually have to make someone come and help me, but very rarely I manage it on my own, like a real pro. A lot of people seem to think that mayo is a dairy product, I'm guessing it's because of the white creaminess. But, it is, in essence, whipped egg yolk and oil. Doesn't that sound appealing? When I was done with my mayonnaise, I simply mixed in a portion of pesto, creating my delicious aioli. The best part was tasting it to make sure it was just right. Last, and most importantly, was the chicken. As described above, the chicken was a fried cutlet, or katsu, style. It was dark meat, wonderfully crisp, and flavored only with salt and pepper. 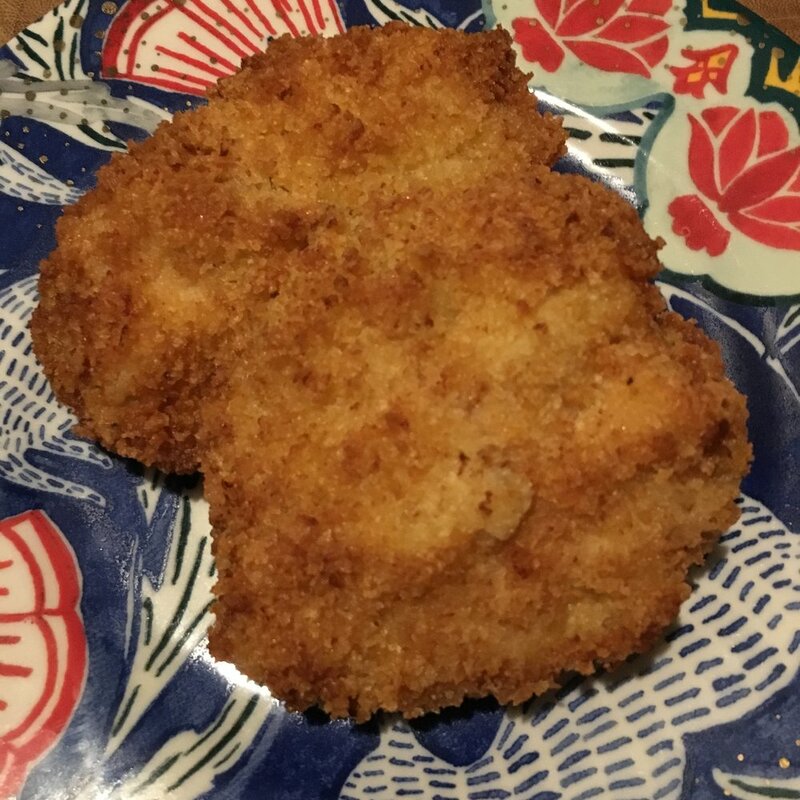 While I had never made chicken katsu, I had cooked tonkatsu and ham katsu before, so I knew the process. I used a cookbook recipe, but this one looks good too. The only difference is that he used white meat and I used a thigh. Basically, the chicken thigh is coated in flour, egg, and panko. , however, always do two layers of the egg and flour, so that it's extra crispy. I always fry my katsu in coconut oil, which I feel makes it less rich and heavy. The color you're looking for at the end of cooking is a nice golden brown. Mine was a little darker than that because I had some trouble with my thermometer. Finally, we have the assembly, with white bread (the one thing I bought instead of making myself), pesto aioli, katsu, lettuce, and fresh tomato. Was it as tasty as I had been remembering? Heck yes. And the extra effort I put into it was totally worth it. Everything had a delicious flavor, heightened by the knowledge that I had made it all myself. All in all, my first copycat dish was a full success! I hope I have inspired you to try this fabulous sandwich, or at least to copycat some of the food you've eaten in the past and can't stop thinking about. Look for future posts where I attempt to copy the food I ate in Japan. Most excitingly, I have a frozen cow tongue in my freezer that will soon be turned into gyutan, the delicious specialty of Sendai. Until next time, keep dreaming about that delicious meal you ate that one time. If you enjoyed this post, check out this one about tonkatsu. Or maybe this one, where I recreate a delicious Thai dish I had on Nantucket. And, as always, don't forget to share this post on your preferred social media outlet.